Well, I processed the last sea turtle nest of the season on St. George Island yesterday. It was a 75-day evaluation, which means it was one of those evaluations of a nest that we do 75 days after it was layed. We do that for nests for which we don't see any evidence of a hatching and subsequent emergence. I checked the nest religiously all during the period that it was due to hatch (55-65 days after laying), but never saw any baby tracks, any caved in area in the nest site, or any other evidence that babies had emerged. It turned out that the nest had hatched, but we must have missed seeing the tracks. It was so windy during that period that they must have gotten swept clean during the night, and by the time I checked at dawn, the evidence was gone. 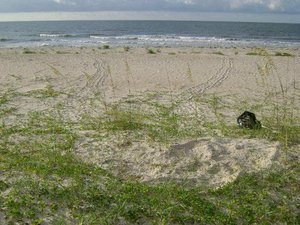 It also happens that we miss the tracks sometimes when we have heavy rains - that will obscure the baby sea turtle tracks, too. 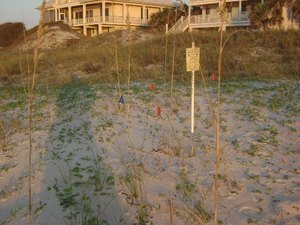 Anyway, it is sad to see the last sea turtle nest hatch on St. George Island for the season, but there's always next year! 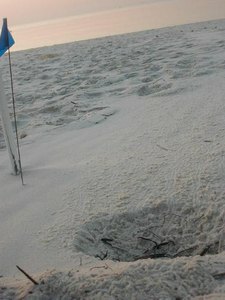 Starting May 1st, we will start walking the beaches at dawn again, looking for the large tracks of mama sea turtles who have crawled up during the night before and layed their nests. May will be here before you know it! At right is a photographic recap of a crawl, the nest, and the baby tracks that show it has hatched!